Famous cities like Los Angeles and San Francisco are the first places that people think of when thinking about California, and stereotypes come to mind about beach blondes or surfer guys, images reinforced by Hollywood movies time and again. However, as wonderful as the cities are, there is so much more to California waiting to be discovered. Rent your own car and get ready to veer off the beaten path to discover forests and beaches so far removed from civilization that you will feel like they were made just for you! Spend some time getting to know the real California, rich in history and natural resources and breathtakingly beautiful. It will give you an entirely new appreciation for the state aside from the glitz and glamor of Hollywood or the artsy quirks of San Francisco. So buckle up, bring your camera and get ready to discover a few places perhaps not in your guidebooks, but very much worth the time. Check out our recommendations for the best hidden gems in California! Tucked away along the spectacular Mendocino Coast, Fort Bragg is about three hours north of San Francisco off of Highway 1. A former army garrison built during the American Civil War, it boasts a spectacular Northern California coastline with views of the Pacific Ocean. Fort Bragg has a pleasant, mild climate all year and is perfect for a few days getaway. While there, be sure to take a walk along Glass Beach, a former glass dump site that is now a fascinating state beach. It might not sound like much, but over time, the ocean has refined the glass to create beautiful sea glass that now sparkles on the shore. Don’t take any with you, though, because it is a state beach. You should also stroll along the coast at MacKerricher State Park – keep your eyes peeled for tide pools and seals! You can also take a ride on the historic Skunk Train or ride a horse along the beach. It’s a perfect, out of the way Northern California seaside getaway. Pismo Beach is located on the Central Californian Coast, an area often overlooked by those touring the state who focus on either the San Francisco Bay Area or the LA Basin but that is not without its own hidden gems. The area was named after the Chumash word for tar, “Pismu”, which was gathered in a nearby canyon. The Spanish were the first Europeans to travel through the area, at the time called “Alta California”, which has been inhabited by westerners since then. This long, wide beach is beautifully surrounded by cliffs and the expansive Pacific Ocean. Digging for clams was once a popular activity that is still permitted, and you’ll occasionally see both people and sea otters off searching for a meal. Try skim boarding in the ocean, but remember to wear a wetsuit as the water is a little cold. Or, check out Dinosaur Caves Park and browse the local Pismo Beach Farmers market for a snack. Let the ocean breeze refresh you and the waves relax you. Located in Humboldt County, Arcata is adjacent to Arcata Bay and home to Humboldt State University. A former logging town, Arcata survived the flux of the industry to resist becoming a ghost town and the university has kept it busy. Except for the townspeople and students, very few people stop in to visit this charming town, even though they pass right by when visiting the iconic Californian redwoods. One of the big attractions of Arcata is its proximity to the Redwoods National Forest. With the bay to one side, with spectacular Pacific Ocean views, and the majestic redwoods to the other, the town is surrounded both ocean and forest. Explore the coastline or hike through the trails winding among the redwoods. Once back in town, have a coffee in the Plaza, the heart of Arcata. In the past, it was where goods were shipped out on mule trains. Now, enjoy the green grass and restored historic buildings, like the Pythian Castle, or hit the beach! California is known for its grand mansions in Malibu, but one rarely thinks of castles when they picture this sunny state. Hearst Castle, built in Cambria, California, defies these expectations. It was designed by architect Julia Morgan, one of the first major female architects, for newspaper tycoon William Randolph Hearst. He worked with Julia to bring to life the different styles he’d seen in Europe, and the bungalow he originally envisioned morphed into a sprawling estate of expansive gardens and 3 houses – the main Casa Del Mar and two guest houses, Casa del Monte and Casa del Sol. Following its decline after its heyday in the 20s and 30s, Hearst’s family found the upkeep very expensive and donated it to the state. Tour Hearst Castle to admire the different architectural influences and sheer grandeur of the buildings. There is a majestic outdoor pool called the Neptune Pool, designed in the style of a Roman temple. This masterpiece faces the gorgeous Pacific Ocean which can be admired from the hills, along with the castle towers fashioned after a church Hearst visited in Spain. A curious design for California’s less formal environment, this gem of a modern-day castle never fails to impress visitors with its whimsy. Located in the historic Gold Country of the Sierra Nevada, El Dorado County was the site of the 1848 gold discovery at Sutter Mill that led to the 1849 California Gold Rush, and was one of the original 27 Californian counties created in 1850. Filled with natural resources and gorgeous state parks, as well as the well-known popular winter destination, Lake Tahoe, El Dorado is brimming with life and beauty waiting around each bend. Bring your hiking boots and check out El Dorado National Forest or Desolation Wilderness – both great backpacking destinations for the outdoors enthusiast. Don’t forget to stop by Marshall Gold Discovery State Historic Park, where you can relive the exciting Gold Rush times and even pan for gold yourself! Or, head up the mountains to Lake Tahoe for some skiing in the winter. No matter the time of year, there is always something to keep you busy here. Located in San Benito County, this town is named after its Mission San Juan Bautista. Originally inhabited by a branch of the Ohlones, the Spanish were the first European visitors to the region. A Franciscan monk, Fermin de Lasuen, founded the mission to convert the native Americans to Catholicism and a town soon formed around the mission, which still stands to this day. Stop by this charming historic town to see the old Mission. You can visit the grounds and see firsthand the Spanish architecture that has been preserved here. Or, stretch your legs at San Juan Bautista State Historic Park to see some preserved historic state buildings and surrounding nature. When you’re done, stroll along Third Street and explore the shops. Fremont Peak State Park is also nearby and perfect for more rigorous outdoors activities such as hiking. 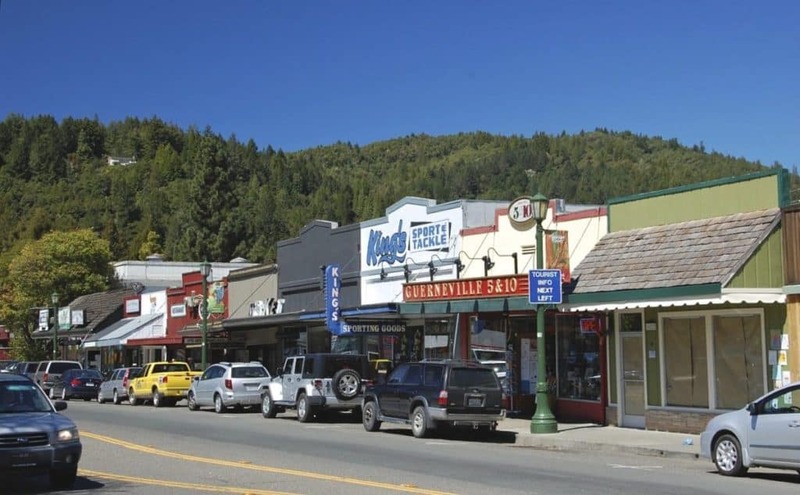 Guerneville was a former logging community in the popular Russian River Valley, close to the towering redwoods. The town was named after George Guerne, a businessman in the 19th century who owned the local sawmill. Now, people continue to be drawn to the town for its small-town charm, which can be found in the plaza that is still the center of town affairs. Enjoy a chess game with friends or locals at the permanent chess tables in the plaza, or wander the small shops to do some shopping. In warm weather, head down to the public beach area on the Russian River – you can fish, swim or boat! Or, sunbathe and catch up on the rays. 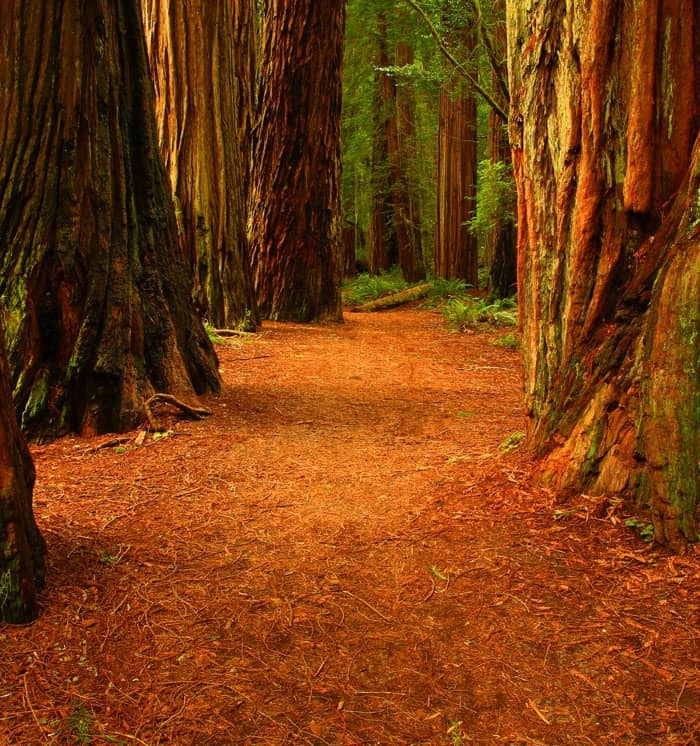 It is close to the beautiful Armstrong Redwoods State Natural Reserve as well. Enjoy this quiet, charming community that is far enough away from cities to be peaceful but close enough that you don’t have to venture too far to reach it. Sierra City is located in the canyon of the North Yuba River, in the Tahoe National Forest area. The town reached its peak population during the gold rush, and has since been reduced in size. However, Sierra City’s main business now is tourism because of its history and picturesque location. Wander downtown Main Street to visit the Busch Building, a historic structure which the Wells Fargo Company occupied in the 1800s, and a Masonic Lodge (you wouldn’t expect one here, would you?). You can also tour a mining museum in the now closed history gold mine, the Kentucky Mine. If you’re here in the summer, fish in the North Yuba or go mountain-biking. You can stay and camp at Wild Plum Campground and enjoy an outdoor getaway. Point Reyes is a cape off the Pacific coast in Marin County, just 30 miles north of San Francisco on the Point Reyes Peninsula. A beautiful stretch of seashore and coastline, the cape protects Drakes Bay on the southern side and was first named Punto de los Reyes (King’s Point) by the Spanish explorer Sebastian Vizcaino when he anchored in Drakes Bay, a name which has survived to this day. Head up to Point Reyes to hit the trails – there are many popular hiking routs along the cliffs offering great exercise and perfect views. You can also take a kayak out at Tomales Bay! Enjoy the vistas from the Point Reyes Lighthouse lookout point, and bring binoculars if you’re into birdwatching; the seashore boasts some of the best birdwatching in the United States. You should also keep an eye out for elephant seals if you’re here in the winter. Grab a bite or put your feet up at Inverness, a small picturesque community lucky enough to be located in this stunning environment. More commonly known as Point Lobos, this beautiful stretch of coast is located just south of Carmel-by-the-Sea, along the north end of Big Sur. A local engineer, Alexander Allen, purchased a large part of the land in 1933 to prevent its development, which has allowed the longstanding wildlife protection and seascape to remain well-preserved and open today for your visit. Bring your hiking shoes and explore the trails that follow the ocean and remember to enjoy the fresh, salty, pine scented air. There are also a few beaches that are simply peaceful and relaxing, as well ideal for scuba diving! Visit the whaling museum and see the historic building once used by local fisherman, or go kayaking or swimming to get more acquainted with the marine life – sometimes you’ll see sea otters floating on their backs as you pass them by! Mammoth Lakes is a beautiful tourist destination today, but thousands of years ago, a volcano exploded, creating the terrain that we enjoy now, and leaving behind a network of hot springs. Several of these have been developed for safe use, mostly located between Bridgeport and Mammoth Lakes and awaiting your visit. Stop in at the almost-ghost town of Benton to find nine hot springs awaiting your soaking pleasure, all filled with pure spring water. Use the taps to control the temperate and spend a day or two relaxing here at the Old House and Inn! You can also enjoy views of the Sierra Nevada while you relax in a hot spring at Travertine Hot Springs, off U.S. 395. You can camp nearby for the ultimate outdoor experience. Relax in any of these natural Jacuzzis and enjoy the relaxation while surrounded by beautiful nature at this true gem of a California nature getaway! The Ancient Bristlecone Pine Forest is located in the White Mountains in a protected area of Inyo County. Home to the Great Basin Bristlecone Pines, these trees grow in the Inyo National Forest between 9,800 – 11,000 feet above sea level, along with Foxtail Pines, and are far older than most other things found in California. Visit this impressive, distant wilderness and follow the Methuselah Grove trail along its 4.5 mile loop to explore the grove where the tree “Methuselah” stands. Scientists have determined that it is 4,848 years old! It has not been marked to avoid vandalism, but the trail keeps you close by. Open from mid-May to end of November, this ancient forest is well worth the visit. Bodie is a ghost town located in the Bodie hills of the Sierra Nevada mountains, now designated as the Bodie Historic District and National Landmark. In 1962 it became Bodie State Historic Park and has preserved a part of the historic town that was born in the Gold Rush. Originally a mining camp, Bodie was at its heyday in 1878, and was one of the larger settlements of California at the time. Boasting amenities of large towns, there was a bank, jail and lots of saloons along Main Street! The lively town declined through the 1800s and by the 1940s, was considered a ghost town. The land owners hired caretakers to preserve the buildings, and thus converted Bodie into a Wild West ghost town. Walk the deserted streets and pass one of the many former gold mills or old storefronts and saloons. Everything has been left as is, included the interiors with their goods. Enjoy the authenticity and give yourself some time to retrace the steps of those who once walked these streets trying to make their fortunes in these hills. Nitt Witt is located in Cambria, California and was built by the artist Arthur Beal, who bought the hillside and gradually carved out the terraces of his house with a pick and shovel to create his castle on a hill. Arthur was a unique person, known as Captain Nitt Witt (hence the name of the property), who collected garbage for Cambria and repurposed much of the waste to build his property. It is even said some remnants are from nearby Heart Castle, where he worked for a time! Come visit for a guided tour courtesy of the owners, who cleaned up and repaired the house after it fell into disarray following the death of Arthur Beal and have passionately preserved his dream. You can still see knick-knacks and his unique architectural style in the house, which is considered a California Historical Landmark. Enjoy the beautiful views and the unusual charm of Nitt Witt Ridge. Located on the Central Californian Coast, Piedras Blancas has become a curious attraction over the past few decades. In the fall of 1990, over 20 northern elephant seals were seen in the cove near the Piedras Blancas lighthouse. Since then, they’ve returned each year, and always with more elephant seals to enjoy this beautiful beach! Visit any time during the year, but the best times are in late January, late April or late October to see over 15,000 elephant seals resting on this secluded beach. Docents will provide you with any information about these curious creatures, and you can see them up close and personal! Don’t forget to bring your camera and enjoy the ocean background and these popular seasonal visitors at Piedras Blancas! Sandwiched between the beaches at Cambria and Morro Bay, Cayucos is located on the San Luis Obispo County coast. It was previously inhabited by the Chumash people prior to the Spanish exploration, who then named it “Cayucos”, their interpretation of the Chumash word for kayak. It is now a charming beach town complete with friendly locals and good weather. Take some time off to enjoy this quiet, relaxing gem of a beach town. There are no stoplights here and Cayucos is filled with good local food and wine, made even more pleasant by beautiful ocean vistas and the sea breeze. There are several routs for aspiring cyclists as well or plenty of kayaks if you want to explore the kelp groves off shore. Whether you stop off the highway to stretch your legs or you stay a bit longer, the relaxed beach town of Cayucos is sure to enchant you. Placerville is located in El Dorado County, near Sutter’s Mill (where gold was first discovered in California). Placerville was formerly known as Dry Diggins because of the miners’ methods of hauling dry soil to running water to separate the gold from the dirt, and eventually was the third largest town in California and a hub for mining operations. If you visit the town now, you’ll see many preserved buildings on the National Register of Historic Places, like the old Soda Works, Confidence Hall, or Church of Our Savior. While perhaps not as shiny as actual gold, the region struck figurative gold and is now rich in wine production in areas like Apple Hill and Pleasant Valley, known for vibrant, flavorful wines. Stop by to revisit Gold Rush History or take a wine-tasting tour! Located at the heart of Santa Barbara’s Riviera, Franceschi Park is named after a noted Italian horticulturalist, Francesco Franceschi. He imported plants from around the world and planted them in Santa Barbara to his garden and building the house in which he resided that is now at the center of these gardens. While the house is a bit run down, the 15 acre park is crisscrossed by trails, and boasts many high vistas from which to observe the town below. The views extend out to the ocean, and are beautiful even if the streets below are shrouded in fog. Bring a book or a camera to enjoy the peace and quiet of this out of the way park, filled with interesting plans and a curious old house. Getting off the beaten path can be rewarding sometimes, and this Santa Barbara gem is no exception. Avila Beach is an unincorporated community in San Luis Obispo County, located almost exactly halfway between San Francisco and Los Angeles. Named after Miguel Avila, who owed Rancho San Miguelito, the town was established at the end of the 1800s and served as the main shipping port for San Luis Obispo for a time. Avila was renovated in the late 90s and now modern walkways and sea motifs line the seashore. There are also 3 piers: Avila Beach Pier, Harford Pier, and the Cal Poly SLO pier used for marine research only. Avila Beach is a great place for whale watching to spot the gray and humpback whales that come to visit or just enjoy the long stretches of sandy beaches. Grab a drink or snack from the shops that dot the beach and enjoy the mountainous backdrop to the Pacific Ocean. Right at the mouth of the Carmel River and the Pacific ocean is this little-known gem of a beach. While Stewart Beach is often overlooked by tourists who flock to the larger, adjacent Ocean Beach, this small and unassuming beach has been a local favorite for years. Shaped in a crescent and filled with soft sand, it’s the perfect place to get away from the crowds and relax. There is plenty of space for those looking to tan, or it’s also a good scuba diving spot to see the diverse marine life. If you wander down to the edges of the beach, you’ll discover tall rocks. Climb up them and search for hidden tide pools filled with sea creatures and watch out for the occasional spray from the waves crashing into the rocks! A true local secret, come snag your parking spot early – the parking lot is small and fills up quickly! An open, sandy beach on the Pacific ocean, College Cove is a beautiful, rocky beach in Humboldt County. A perfect swimming destination in the summer, there are also ample surfing opportunities here for those brave enough to walk the steep trail down to the beach. The long beach is split in two when the tide rolls in, with the surfing area to the northern end and a more secluded beach and natural arch at the southern point. While you’re here, you might see sea lions or seals, and sometimes whales who all come visit this secluded spot. When the tide recedes, explore the tide pools left behind for starfish, clams, sea urchins and mussels! Enjoy College Cove, one of Northern California’s finest beaches, surrounded by the ocean on one side and pine and spruce on the other. Badwater Basin is the lowest point in North America, about 282 feet below sea level. Located in Death Valley, this sinkhole is consisted of a small spring-fed pool that is tainted with salts from the surrounding basins, making it undrinkable and adding to the unique physical appearance of the basin. Many people feel they have been transported to another planet when they see the basin stretching out before them, covered by the salt crust cut into hexagonal honeycomb shapes from the constantly evaporating water. Come visit this curious corner of the world and bring your camera – there is animal and plant life existing in the pool, such as pickleweed and the Badwater snail. Check out the sign marking “sea level” on the cliffs overlooking the Badwater Basin, and take care if you decide to cross the salt flats as it can be just a thin white crust over mud. Enjoy the biodiversity present and unique salt flats of the Badwater Basin – bring your own camera and bottle of water! A coastal city in San Diego County, Solana Beach is located near Cardiff-by-the-Sea and was first inhabited by the George Jones family in 1886. In the early 1900s, Ed Fletcher began developing the land to provide access to the beach and establish a community which has continued to grow to this day. Now, Solana Beach is a charming surf community on some of the prettiest stretches of San Diego coast. Head out to Fletcher Cove Park or take a hike at Annie’s Canyon Trail. The town is filled with delicious restaurants and cute shops lining the beaches! Enjoy some seafood at the Fish Market and enjoy some wine at Carruth Cellars Urban Winery and enjoy this Southern California gem. The Winchester Mystery House is a curious attraction in San Jose, California. It was the former personal residence of Sarah Winchester, the widow of the gun magnate William Winchester. She designed the house as a Queen Anne Style Victorian mansion but without any master building plan or architect, building frantically as she claimed that the house was haunted by the ghosts of those killed by Winchester rifles, and demanding construction continue 24/7 without breaks. Sarah Winchester’s curious life is reflected in the oddities of the house, which has been open to tourists for years now. Staircases end and go nowhere, doors open into walls, windows face only more interior rooms.. A structure extending seven stories high by the time she passed, many believe these abnormal characteristics has something to do with her attempts to appease the spirits she believed followed her. Nowadays you can tour the house with a guide and see for yourself these oddities. You’ll notice it is only 4 stories tall as the house was damaged following as series of earthquakes, but the strange air about it is well preserved. Prohibition was a dark time in U.S. History. Outlawing alcohol, shutting down popular bars and effectively hamstringing those who loved the nightlife, many people decided to search for alternative ways to continue having a good time. It should be no surprise to anyone that Los Angeles never missed an opportunity for a good party. Despite rigid alcohol laws, over 11 miles of tunnels under the city became passageways to speakeasies, like the famous King Eddy Saloon that doubled as a piano store, but whose basements formed part of the tunnel networks. While these tunnels are not in use any longer, they are still used as film locations or easy shortcuts by city employees. If you’re dying to escape the crowded LA streets and head off the beaten path, slip behind the Hall of Records on Temple Street and look for an unassuming elevator. This will take you down to a subterranean passageway filled with street art. Different gates limit your exploration to earthquake safe areas. It should be noted that the tunnels are officially “closed to the public” so explore on your own time. Or, you can also have a now legal drink at the King Eddy Saloon, operating as a bar once again! The basement still remains attached to the network of city tunnels. Located in San Mateo County, Pescadero is a small community just south of Half Moon Bay. Surrounded by the Pescadero Marsh, a wildlife refuge, and Pescadero Creek, the town is a local tourist destination during the warm summer months. Campgrounds are nearby, such as Memorial Park, as well as rural roads perfect for biking and trails ideal for hiking through the Santa Cruz Mountains. Wander the quaint small town main drag off of Pescadero Creek Road or stop in for a drink at Duarte’s Tavern. There is a local Harley Farms Goat Dairy, or a beloved taqueria at the gas station called Taqueria y Mercado de Amigos. Stop in at Arangeli’s Market for some delicious, homemade bread that locals and tourists rave about. Next time you’re in the area, stop in. It might look small, but this small town packs a lot of spirit and is a true California gem.